The Tampa Bay Rays announced that they were cancelling Manny Ramirez Bobblehead Day following his “retirement” after a failed drug test. 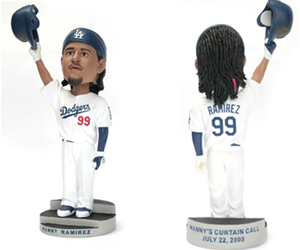 In light of all the “Manny being Manny” decision that Ramirez made during his career, wouldn’t KEEPING Bobblehead Day be more appropriate? I’m just saying. So will the Bobbleheads end up as a toys for children in an impoverished country like the t-shirts of the losing teams in championship games? That seems wrong on so “manny” levels. This entry was posted in Boston Red Sox, Los Angeles Dodgers, Tampa Bay Rays and tagged Baseball, Bobblehead Doll, Boston Red Sox, Los Angeles Dodgers, Major League Baseball, Manny Being Manny, Manny Ramirez, MLB, Performance-enhancing drugs, Tampa Bay Rays. Bookmark the permalink. HAHAHA that’s awesome. I think they should give them away randomly to people as a gag gift type of thing. I’m seriously trying to figure out how I can get one of these! What a relic to add to my collection.